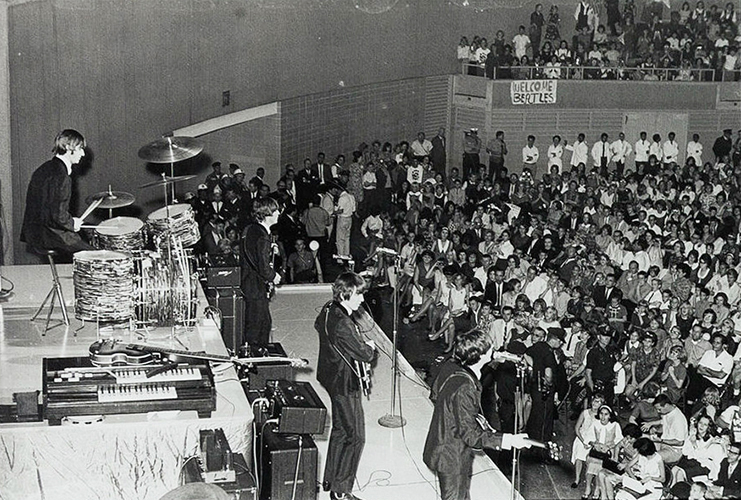 Kids in Dallas in 1964 were going nuts over this new music. Their first US album "Meet The Beatles!" was soon going to be at Minsky's record shop in Preston Forest Shopping Center. My friends and I would spend all afternoon at Minsky's, browsing the new releases and listening to record albums in a soundproof booth. After hearing a few songs from the new Beatles album on the radio, I rode my bicycle less than 2 miles and bought their first record. In mono. Once I got home, we, my brothers and my mother, all gathered around the deluxe Hi-Fi cabinet in the living room to play this revolutionary new sound. We all sat enamored and intrigued. This wasn't the typical sound of the day. It moved. It sang to us. It was fresh and invigorating. Though the media hype was just beginning, we knew this was going to be something very big. Within days, we learned that the Beatles would be on the Ed Sullivan Show, a popular variety show hosted by the Talk of the Town master himself. There were usually puppets, circus acts, singers, and dancers; and, recently, some band or act for the teenagers. The entire nation watched, well, at least 73 million of us - a record audience for a television show. "And, now, (some screams) something for (louder screams) the kiddos (pandemonium screams) - The Beatles". 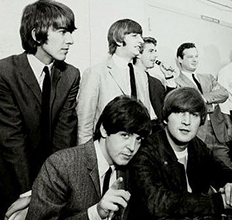 The song "All My Loving" was the first sung by the group, then "Till There Was You" - at the bottom of the screen there were name captions: "Paul McCartney" "George Harrison" "Ringo Starr" "John Lennon. Sorry girls, he's married. " Years later, in New York City, I walked by the Ed Sullivan Theater on Broadway and noticed an open side door on 53rd Street. I went right in. The auditorium was somewhat of a mess - wood, tools, and debris - clearly a construction site. But I was able to wander up to the stage. Just after I stepped up onto the mostly barren stage, a voice called out, "Hey!" I played dumb. A security guard joined me on the stage. He declared that I was not supposed to be in there. I ignored that silly statement and began asking him questions. "What's going on here?" (referring to the construction and mess). I have read that security guards often get lonely and hungry for human contact and conversation. I was hoping that if I engaged him in banter, that would allow me more time to look around. He tersely explained, it's the new set for David Letterman. He seemed a bit surprised that I didn't know that. Letterman had just left NBC and had recently signed his contract with CBS. The security guy was younger so he was fascinated and starstruck by the Letterman set. I, too, was somewhat fascinated, but not nearly as much as I was by the fact that I was standing on the very stage where The Beatles held their first US performance years earlier. I looked out and recognized details in the theater auditorium that I had seen on the Ed Sullivan show on that Sunday night. Sure enough, he seemed to enjoy talking with me and our conversation lasted long enough for me to embrace this special auditorium. Back to 1964 - the radio stations and the newspaper announced the upcoming tour schedule. After several performances in NYC, the band would set out on a cross-country sojourn. The last stop before heading back to New York was going to be Dallas, Texas. I couldn't believe it. Right here! Well, I want to go. I must go. Tickets went on sale at only one place - the Preston Ticket Agency, inside Preston State Bank on Preston Road, just south of Northwest Highway, near Youngblood's fried chicken restaurant and just down the street from the very first suburban Neiman-Marcus, their second store, after the original in downtown Dallas. 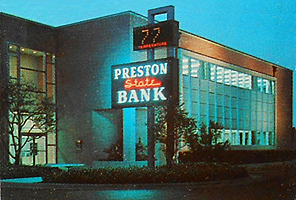 My parents banked at Preston, so we knew it well. I shared my plan with friends and family. I was going to get up real early and ride my bike (I was 14 years old) to the ticket agency, a trip of about 2 miles, crossing only 2 major streets. My dad took me in the car the day before so we could map out the safest route for me to take. He was concerned but also accommodating of my desire - no, my need, to get those tickets. That morning, too early for anyone but the paperboy and maybe some deliverymen, I woke up, put on my shorts and shirt, quietly opened the side door to the garage, and wheeled my bicycle out to the driveway. I coasted down the slope of the driveway and was off in the cool dark morning. I followed the pre-determined route with no problem. Thanks, dad. At the ticket agency, I hitched up my bike to a post and walked over to the line that had begun forming the day before. Some people were in sleeping bags and had small coolers of food and drink. I took my place at the end of the line. We waited in the light of the bank building's floodlights, a community of music fans eager to see our idols, the original boy band. Every now and then, a rep or DJ from one of the two local rock-and-roll radio stations, KLIF and KBOX, would talk to those in line. There would have been a more festive atmosphere, but, I think most of us were just too tired and sleepy. The excitement level, however, rose as the sun came up and the darkness faded away. The frenzy peaked when we saw ticket agency employees arrive and begin to start their day - turning on lights, taking off coats, and straightening the piles of stuff on their desks. A security guard stepped to the glass doors and we could hear the clicks as he unlocked each of the two. I dug out 3 ten dollar bills from my jeans pocket and handed them to her; she handed me 6 tickets to the concert of the decade. I clutched the pieces of light cardboard as if I had just found some valuable treasure. Stepping out of the lobby to my bike, I passed the rest of the line that was now very animated. I later learned that the concert, from this one ticket outlet, had sold out within a couple of hours. I made sure the 6 tickets with a rubber band around them were secure in the front pocket of my jeans and unchained my bike for the journey home. My brother woke me up. 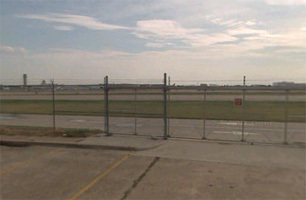 "Let's go to Love Field - the Beatles are landing. " 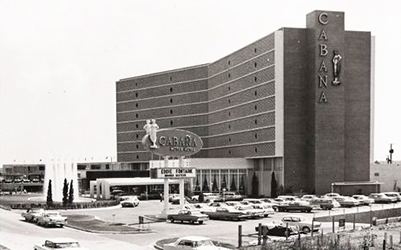 They stayed in the Cabana Hotel on Stemmons Freeway. Designed by the same team that had just finished Caesar's Palace in Las Vegas. 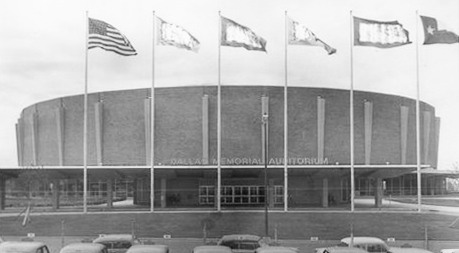 Randy's older brother, Bruce, drove us to Memorial Auditorium in downtown Dallas. We had been awaiting this trip all day. 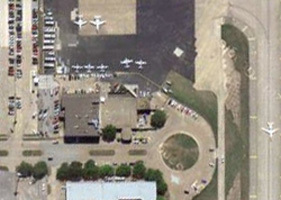 Bruce parked the car in the large lot behind the auditorium, now the site of the mammoth Dallas Convention Center that includes the remodeled auditorium. In 1964, however, the round arena sat there by itself. We joined the throngs of teenagers making their way to the line that had formed outside the entrance. Apparently they hadn't yet opened the doors. There was incredible energy and excitement in that line. Anticipation so great that it was spilling out into the evening air. In line with me were Bruce, his brothers Randy and Jim, and Alec and John. 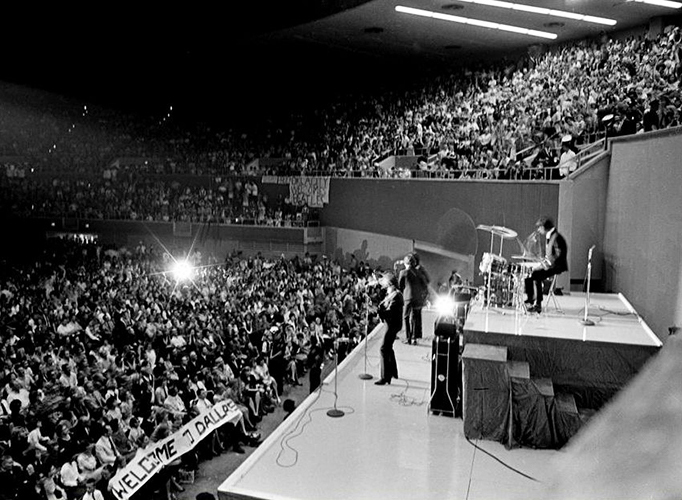 Representatives from the Dallas chapter of The Beatles Fan Club were walking up and down the line repeating their disturbing message: if fans threw items up onto the stage, the Beatles would end the concert. One of the reps even told a story of exactly that happening in one of the earlier tour stops. No one in the crowd wanted the concert to end early, so we all nodded our understanding and implicit agreement to obey their request. Soon, the doors opened. It could have been soon or it could have been a long time - we were so caught up in the excitement with our fellow fans that the wait time was not an issue. The line moved up to the ticket takers and then on into the vast hallways that curved around the entrance tunnels to the arena seating. We went right to our seats. The arena was a bowl of activity:talking, visiting, waving and yelling, or buying drinks and souvenirs. You could feel the electricity. I imagine it may have been something like our parents experienced at a Frank Sinatra concert. But to us, it was new and exhilarating. As we got closer to the stated concert time, the anticipation heightened and became a force so powerful that its momentum caught up even those few older folks in the crowd. But, we had to wait a while longer - the concert would be delayed about 15 minutes (the next morning we learned that a bomb threat had been called in and the arena was still being searched. ) The lights began to dim, section by section. New lights became apparent - the constant flashing of bulbs from flash cameras. An announcer, a local disk jockey, walked out onto the stage and spoke some typical emcee schtick, but, not too many of us were listening. He introduced the opening act, the Bill Black Combo. We politely tolerated the opening groups. Next were The Exciters and Jackie DeShannon. Then the lights came back up in the arena and some stagehands came out onto the stage to rearrange the equipment. 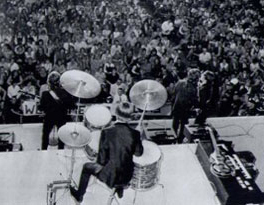 Ringo's familiar drum set with 'The Beatles' painted on the front of the bass drum was brought out and set up. You'd think it was the greatest event on earth, judging from the hysteria and screams over just seeing that drum. The same DJ returned to introduce the main act. I am not at all sure what he said as the screams overpowered his trained announcing voice. The lights dimmed again and it was on. 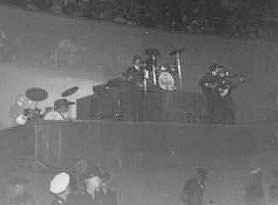 The four lads appeared in their matching suits and went right into, "Twist and Shout". The next 30 minutes were just a blur of constant screaming, music, and sheer joy. It was truly an evening I can never ever forget. 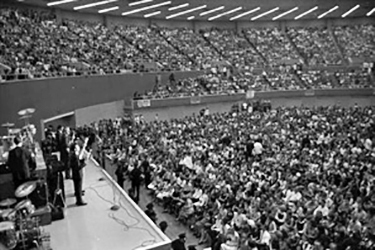 Photos from the press conference and the concert in Dallas, 1964.